OSRestoreX is an on-device alternative to semi-restore for iOS 10. This is one of the best apps to restore your iPhone to a clean state in few simple steps. Nathanaccidentally is the developer and few other guys joined their hands to develop the app together. It works by using the Coolstars Stashing method by moving all tweaks installed, to /var/db/stash (user storage). Moreover, It can remove all your tweaks and user data in one click. Do not panic, all the tweaks and user data will be stashing or moved to a static location on the device. Later, It will remove .installed_yaluX if you have installed it for jailbreaking. It means that the Yalu should start from the beginning whenever you try again. Moreover, The jailbreak tweak Filza File Manager will help you better organize the folders and file locations while performing the task. All the user created data will be stored at /var/mobile/ and that will be completely removed by OSRestoreX as a next step in the procedure. Don’t worry, You can rebuild this data and it’s sub folders any time by performing “Erase all Contents and Settings“. Moreover, The app will remove everything created by the user like settings, and tweaks expect the most wanted files for the device. Removing the mobilesubstrate will help you malfunctioning DRM and affecting the device. I can say that this is one of the important steps of the app to carry out. The app will carry out few more important tasks and make your device clean and neat. Just go through the installation method to get it on your iDevice and feel the uses as well. The app is available in two versions. One is on-install version and the other one is OSRestoreXTerm, Which is nothing but the terminal version. You can Run and Install OSRestoreX file directly on your iOS device without much skill. Whereas the OSRestoreXTerm, the terminal version can be run from the terminal by running “OSRestore“. Check out the simple steps to download the apps to perform restoring iOS 10. Launch Cydia app if you have installed it already. Otherwise, Install Cydia on iPhone first. Go to Manage >> Sources on the Cydia app. Click on Add by going through Edit option at the top right corner of the iPhone or iPad. 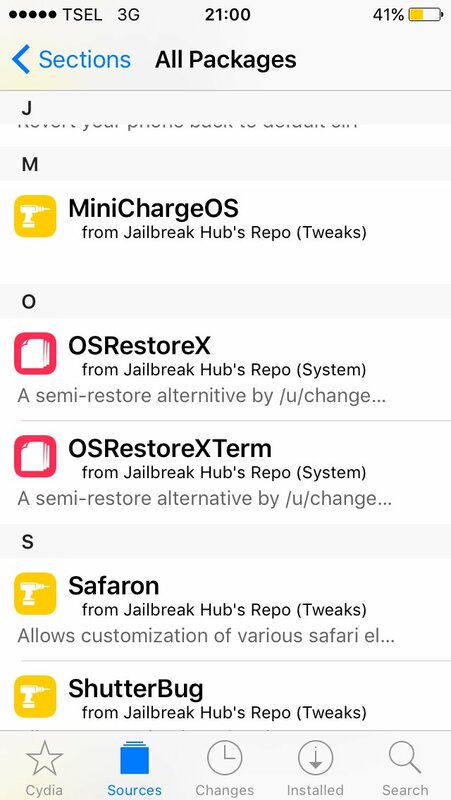 Copy “https://repo.jailbreakhub.org/” without quotes and paste it on the Cydia app. The repo will be added to the Cydia app in few minutes. Now you can Install either OSRestoreX or OSRestoreXTerm on your iOS 10 device. Check out the image attached below. You may follow the on-screen instructions by click on any app to finish the process of installation on your iDevice. I hope you are ready to restore your iOS 10 and make your iPhone clean. I am just reminding you that this method will erase everything that is relating to the user like Pictures, Videos, Tweaks and Jailbroken Apps, etc. Let us suppose you are installing the first app. Decide yourself within 5 seconds of time whether to continue or not as it will proceed further in the next few seconds. It will take some time to finish the installation process. Once it’s done, It will tell you to use “Erase all Content and Settings” at the time of wrapping up the process. It is nothing but the semi-restore is done. You can check your iPhone or iPad for the changes. Of course, you can also install the OSRestoreXTerm similar to the on install app. But, the later is completely a different process using the Terminal. Check out the steps that you need to perform now. Install the Term version from Cydia. Open Terminal on your device. Type “su” without quotes and type your password. The Default password is “alpine” without quotes. Now, Type “osrestorex”. So it will erase all the content and settings. Cydia Eraser will be as best as the iTunes restore of course. But this process is way better than the Cydia Eraser and other Semi-Restore tweaks. Moreover, Cydia Eraser is not updated for iOS 10. And you cannot use that app on your iDevices having iOS 10 or later. Nathan and his team are still working for the betterment and he will be providing us “Sifts through /Applications and remove leftover apps (all non-stock apps) from the jailbreak” in the next update. This OSRestoreX Tweak will not restore the permanently modified or deleted system files with the restore as Cydia Eraser. Here is the best semi restore alternative to restore your iOS 10. I suggest you try out this tweak and make your iPhone or iPad clean and perfect. You will have two methods of restoring the device through the on-install app and the terminal app. I have provided the instructions for both of them. I would like to hear you through comments. Thank you so much.